Greenpois0n RC5 release few hours back has some bugs like stuck at Greenpois0n RC 5 initialized screen error or loader failing install Cydia which can be easily fixed with reboot. But stuck at greenpois0n initialized screen is very annoying and completely random issue leading to no proper solution to make it work. 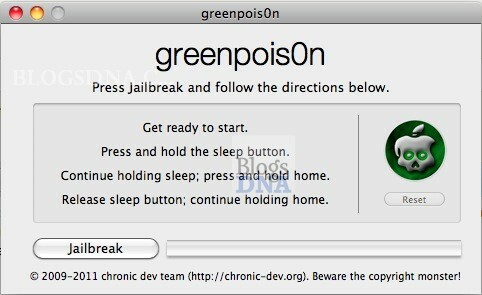 Now here is fixed version, Greenpois0n RC5_2 just released by Pod2g member of Chronic Dev team, The procedure to untethered jailbreak iOS 4.2.1 on iPhone 4, 3G, iPod Touch 2G, 3G & 4G and Ipad is similar and we have already covered here. So if you were one of those facing Greenpois0n RC5 Initilisation error may download this fixed version using below link. Download Greenpois0n RC5_2 to Untethered Jailbreak iOS 4.2.1.
omg it finally works. i just spent the past 4 hours trying every single thing. damn it… about time. Thank you so much for posting this fix! I spent way too much time trying to use the first version last night. You rock! – Are you sure you can make an unlock tool this decade?